Fantasy Live on NASCAR.com assigns a money value to each driver, with each team consisting of 5 drivers with a total value of $100 or less. Once you “hire” a driver, their value is locked in for the season. However, since a drivers value can fluctuate, it becomes very hard to add and/or drop drivers each week as values seem to increase faster than they decrease. 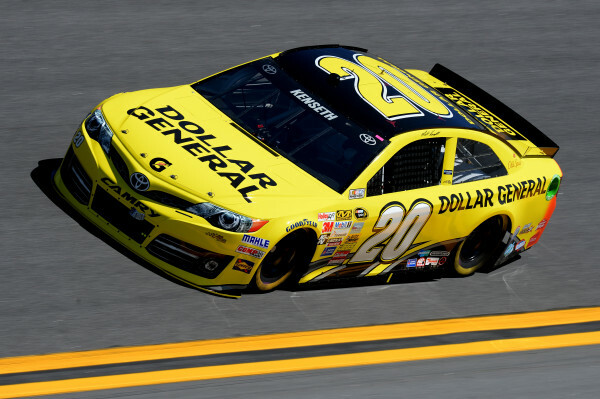 Last weeks team was Matt Kenseth, Denny Hamlin, Dale Earnhardt Jr, Cole Whitt and Michael Waltrip. This week, due to value increases and decent historical statistical value, we are pretty locked into keeping Kenseth, Hamlin and Earnhardt Jr.
Obviously we need to drop Michael Waltrip since he isn’t even racing this week, and we need to look at limited data and evaluate Cole Whitt versus some other options in the same price range. Cole Whitt’s value on NASCAR.com is $12.00. Similar drivers in his range are Danica Patrick ($16.00 – up $4.50), Justin Allgaier ($15.00 – up $9.25), David Gilliland ($14.00 – up $5), Ryan Truex ($13.00 – up $8), Joe Nemechek ($11.00 – up $6.25) and Swan Racing teammate Parker Kligerman ($11.00 – up $6.25). If you look at historical data, and unfortunately you need to compare using some Nationwide data for Kligerman and Whitt, but you come up with about an equal rating for Kligerman, Whitt and Patrick. However, if you look at Sprint Cup results for Patrick, you see some terrible finishes, so I eliminated her until I see some better consistency. I’d rather take a shot on a newer driver, trying to find a bargain. Allgaier was a great buy if you got him last week at Daytona, but his increase this week ruled him out for me. Gilliland is consistent, but not worth $14.00. Ryan Truex at $13.00 with that team is insane. The same for Nemechek. That left we between Kligerman and Whitt so I stayed with Whitt. To replace Waltrip, I had $12 left over, so I went and got David Ragan. Another consistent finisher, with a team that is always going to run the full race distance. I’ll gladly take a 25-30 place finish with my two weakest drivers, I just can afford a 4oth. I feel I get that with Ragan and Whitt. So, while individually Kevin Harvick, Joey Logano or Brad Keselowski are probably the top drivers to select this week, their increase in value is too much for me to withstand so I’ll go with Kenseth, Hamlin, Earnhardt Jr., Whitt and Ragan. Last week I finished 7th in our league out of 30 so I think I am on the right path. For my manufactuer, I selected Ford to cover in case Logano or Keselowski win. I took Denny Hamlin’s crew for my pit crew as they were one of the best last year and were top 5 last week as well.